Revenue Streams stories at Techdirt. stories filed under: "revenue streams"
As you hopefully already know, we take a bit of a different view of ad blockers around here on Techdirt, recognizing that many people have very good reasons for using them, and we have no problem if you make use of them. In fact, we give you the option of turning off the ads on Techdirt separately, whether or not you use an ad blocker. And we try to make sure that the ads on Techdirt are not horrible, annoying or dangerous (and sometimes, hopefully, they're even useful). Most publications, however, continue to take a very antagonistic view towards their very own communities and readers, and have attacked ad blockers, sometimes blocking users from reading content if they have an ad blocker. Perhaps no publication has fought harder against ad blockers than German publishing giant Axel Springer, the same company that frequently blames Google for its own failure to adapt. German media giant Axel Springer, which operates top European newspapers like Bild and Die Welt, and who recently bought a controlling stake in Business Insider for $343 million, has a history of fighting back against ad-blocking software that threatens its publications’ business models. Now, it’s taking that fight to mobile ad blockers, too. According to the makers of the iOS content blocker dubbed “Blockr,” which is one of several new iOS 9 applications that allow users to block ads and other content that slows down web browsing, Axel Springer’s WELTN24 subsidiary took them to court in an attempt to stop the development and distribution of the Blockr software. Specifically, explains the law firm representing Blockr, Axel Springer wanted to prohibit Blockr’s developers from being able to “offer, advertise, maintain and distribute the service” which can be used today to block ads on http://www.welt.de, including the website’s mobile version. Isn't that nice. Rather than recognize that people don't like your ads, you try to sue the companies serving an actual consumer need so that you can continue to piss off your readers. It's the dinosaur strategy -- rather than innovate, you sue to try to stave off the inevitable decline. We get it. Many of you really hate online advertising. And, indeed, there's often a good reason for that. The ads can be irrelevant, intrusive and annoying. And, in some cases, they can even be dangerous, as scammers or those with malicious intent slip bad code into ad networks in order to wreak havoc on visitors' computers. So here's a deal: if you don't want to see display/banner ads on Techdirt any more you don't need to. Just go to your preferences page (whether you have an account or are just browsing without a login) and click the button saying you want to disable ads. And, that's it. No more network display ads. This isn't one of those "pay us to remove ads" deals. It's up to you. That said, obviously if you disable ads we're likely to make less money. So if you choose to do that, we'd appreciate it if you supported us in other ways, such as via our Insider Shop, where you can buy a membership that gets you certain perks, or through our Deals Store, where you can support Techdirt while buying some cool products and services. But, again, this is not a requirement. If you don't like ads on the site, turn them off. If you've been paying attention to the news lately, there's been all sorts of hand-wringing about "ad blockers", with the hair pulling reaching new levels of craziness a few weeks ago when Apple finally started allowing ad blockers into the iOS app store. Some have been whining about how this is going to kill off the free internet or somehow lead publishers to fall to the side as internet giants like Google, Facebook and Apple colonize the independent web. There have been all sorts of debates about whether or not ad blocking is ethical, which seems like a pointless debate to me, since users don't care. They're going to do it anyway. I'm planning to do another post in the near future on how the online advertising/publishing ecosystem should react to all of this, but so far they've been reacting... badly. The IAB (Internet Advertising Bureau) has gone so far as to discuss suing over ad blocking, and some sites -- including the Washington Post -- have decided to block access to users who have ad blockers enabled. We've even been approached by multiple companies who claim to offer a form of ad blocker blocker, that will either insert new ads even when users have ad blockers, or otherwise pester users with ad blockers turned on. This seems like the exact wrong approach. It's somewhat reminiscent of the way the RIAA and MPAA reacted to the internet challenging their business models. Rather than listen, recognize what the public wanted and adapt, they whined, screamed about ethics and went to court. And how's that worked out for everyone? We've always said that those who adapt to these challenges are likely to do better, and part of that means actually listening to your fans and helping them do what they want. So that's what we're doing: if you choose to disable ads, you just need to go to your preferences and click a button and that should do it. It's important to note that this is an experiment, though we have no plans to suddenly pull it back (that would be ridiculous). For now, it only applies to network display ads -- or what most people think of as "banner ads." In the future, we may (or may not!) experiment with further ability to customize what you see and what you don't see on the site. Again, there is no expectation here in terms of how you respond, but running this site does cost money -- so we would certainly appreciate it if you also were willing to support the site in other ways, whether you turn off the ads or leave them on. But, on the whole, we're going to allow you to decide how you best want to support this site and trust you to figure out the best way, rather than forcing the choice upon you. Thanks for being a part of this community and we look forward to continuing to deliver interesting stories and conversations going forward. We've discussed in the past that the Future of Music Coalition was putting together a fantastic artists revenue streams project, in which they sought to look at the myriad ways in which musicians make money today. 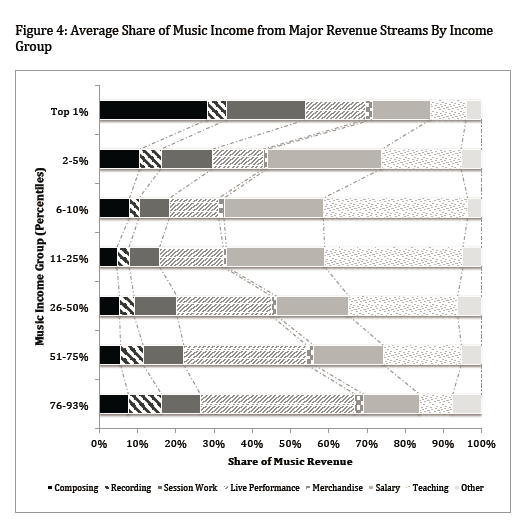 FMC has been releasing bits of data from the project here and there, but now TorrentFreak has alerted us to a big analysis of the data done by Northwestern Law professor Peter DiCola, entitled Money from Music: Survey Evidence on Musicians' Revenue and Lessons About Copyright Incentives. It's worth reading in its entirety. 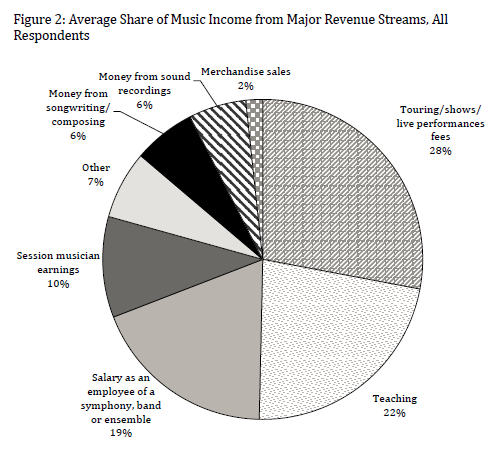 TorrentFreak highlights one key point: which is that of the surveyed musicians a mere 6% of revenue comes from the sale of licensed music. We've long argued that music sales make up a minority of the revenue artists make, so it's good to see some support for that. 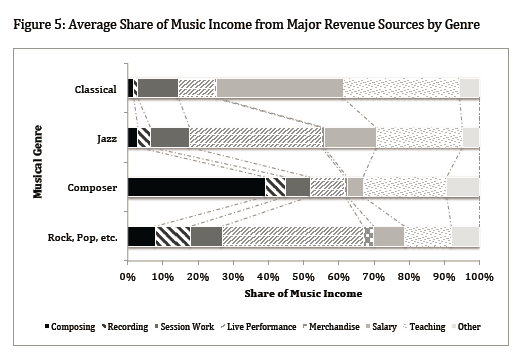 Of course, the report notes that different types of musicians make money in different ways, so this does not mean that the 6% number applies across the board to all musicians. 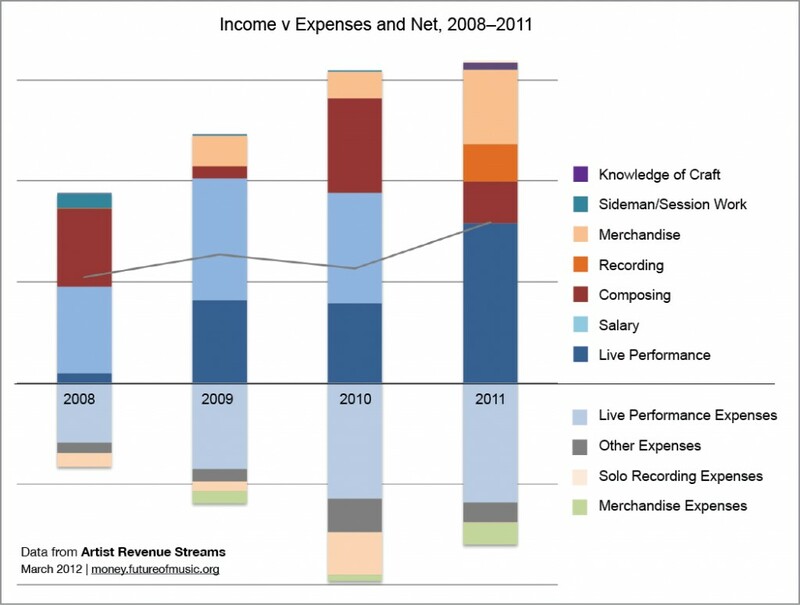 There certainly are some musicians who make a large percentage of their income from sales. But the key point is that those artists are in the minority, and focusing solely on music sales and changes to that market gives you a very distorted picture of how artists are making money, and the impact of things like a decrease in revenue from music sales. There is plenty of interesting data in the report, but one thing that struck me concerned the artists' general attitudes towards technology. It's mixed, to be sure, but some of the often-repeated claims by some maximalists don't appear to be true. For example, we hear stories that part of what's so unfair with the system today is that the artists are "losing control" over their works, but many artists don't agree with that at all, recognizing that technology means they have a lot more control over their works. The difference, of course, is that the complaints about "loss of control" were really more driven by the old gatekeepers -- mainly the major record labels. For them, it's true that they really have been losing control, but much of that control has actually moved back to the artists (and, yes, much of it has also gone to fans). But for artists who were outside of the major label system, it's often meant much more control over their own careers. The end result is that artist attitudes towards technology and its impact on their careers is really mixed. In many cases, on key questions -- it seems like artists are almost equally divided. You can see that in the chart below: From this chart, you can actually see that just as many artists think that file sharing has helped them as think that it has hurt them. Remember that the next time someone claims to be speaking for all artists' attitudes on these kinds of things. If I had to guess, it seems likely that trends are moving more towards artists recognizing the benefits of such things -- but I could be wrong about that assumption. I guess we'll see the next time they do this survey. Those charts show some differences, including that higher earning musicians do tend to rely on copyright more, but it's still a relatively smaller part of their income than other sources. 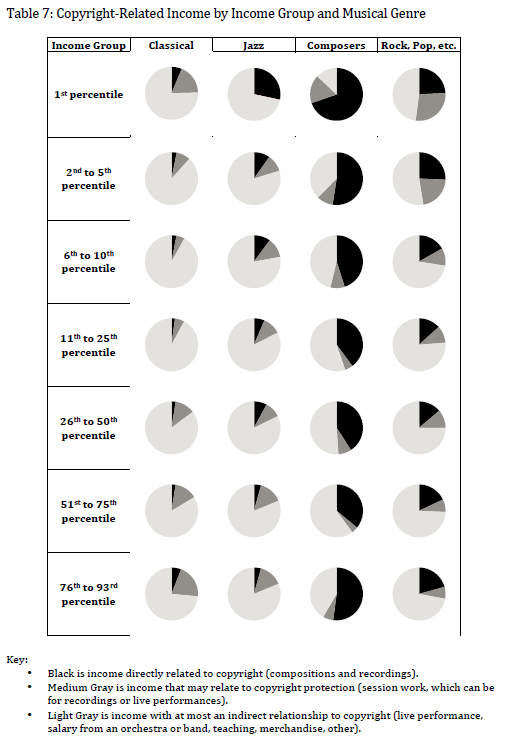 Putting it all together, DiCola created this wonderful chart that looks at copyright- vs. non-copyright income across different income levels and genres: Really interesting stuff. Not surprisingly, composers rely on copyright quite a bit, as they tend to get a significant chunk of revenue from licensing efforts. But even they still tend to rely heavily on income that is at best, indirectly related to copyright. All in all a very interesting read, as you begin to realize that the primary story usually told -- that artists all rely on copyright and that infringement is clearly a bad thing -- isn't necessarily true across the board. The band OK Go has made quite a name for itself over the years as a pioneer/innovator in a number of different ways in the music world. The group has become incredibly famous for their videos, each one of which seems to up the difficulty level. Years ago, they had a simple dance video (filmed in one of their backyards, if I remember correctly), which went viral. Then they had the famous dancing treadmill video. There have been a few others, including a massive Rube Goldberg machine, and now they've taken it up a notch with their latest video, which was part of Chevy's Super Bowl commercial for its new Sonic vehicle. They basically used the car -- and a massive amount of setup -- to have the car help them perform a song: In case you're wondering, there were 55 pianos, 288 guitars, and 1157 of what they describe as "homemade instruments" to make that one work. Also, the video took four months to prepare and four days to shoot... and all of the car driving is actually done by lead singer Damian Kulash, who actually took stunt driving lessons (kinda neat that he can probably write that off as a business expense...). The video description also notes that "each piano had the lowest octaves tuned to the same note so that they'd play the right note no matter where they were struck." Just in case you were wondering. Of course, beyond just being kinda cool, this hits on a few points that we talk about regularly. First off, it shows how OK Go has continued to do what it set out to do when it freed itself from its EMI contract. Despite their videos getting millions upon millions of views, EMI was too clueless to know how to actually monetize such success. The band figured it could do a better job itself, noting that if you have the fans, there are always ways to make money. The band has also been pretty vocal about being against things like DRM and for things like making it easier for fans to get their music. And, here, they're making money by getting sponsors to help them create their crazy music videos. This isn't a first. The big Rube Goldberg video was sponsored by State Farm. And, no, no one is saying that every band should get corporate sponsorship (though I'm sure some critics will accuse me of saying exactly that!). It's just that there are all sorts of creative ways for artists to make money these days, and getting some corporate sponsorship is one that gets little attention, but has been growing massively over the past few years. In fact, it was one of the key themes at MIDEM this year, including a fascinating interview of Mark Ronson with Wendy Clark of Coca Cola by Ian Rogers from TopSpin, all about Coca Cola's efforts in the music space. One of the key things in this is the recognition that content is advertising. Lots of people have recognized the reverse: that advertising is content... but things really open up when you realize that content itself is advertising. And that's something that a lot of brands are recognizing by tying themselves to different content creators, and letting them do cool stuff around their brands. I know that some people find this to be some form of "selling out," but as Ronson points out in the video linked above (and, as I'm sure the folks in OK Go know well) that's pretty silly. Most consumers today know that artists need to make money, and as long as the brand gives them the freedom to be who they are and do what they do, most fans have no problem with these kinds of deals.